Hundreds of people came to celebrate Bengali culture and heritage at the Boishakhi Mela organized by NRB World Wide and planned by Tofazzal Liton. This year, Boishakh Mela started around 11 am on April 13th and continued until 10 pm on April 14th in Queens, New York. The mela was held in P.S. 69 in Jackson Heights, New York. Katerina Hope, 47, the security director of the mela said, “I have been working as a security officer at the P.S.19 for the last 19 years...and never seen so many spectators in one place. To manage crowds...full of people...we had to bring six more security officer for the mela.” Ahmed Mazhar, a prominent Bangladeshi writer, described this year’s mela event as “...crowded, pleasant, and interesting.” He said, “it was so crowded...almost pressed together like peas in a pod. Authorities had to shut down the mela’s main-gate for security purposes. It was just simply too many people in one place. Security officials were only letting people inside when someone exited out of that place. I had waited for couple hours...and still couldn’t get inside of the mela. 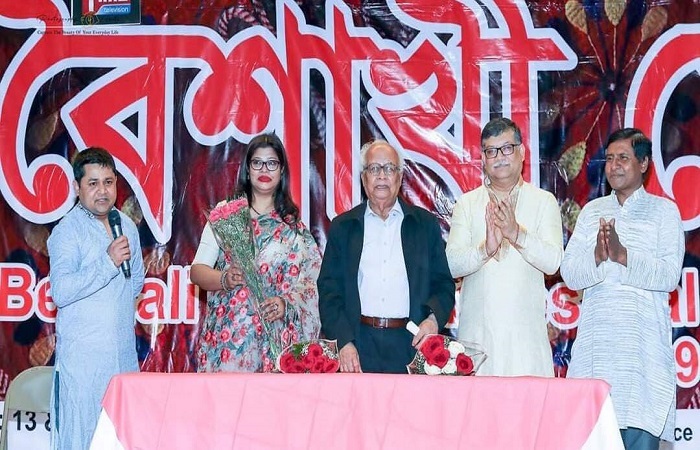 Nonetheless, it was great to see hundreds of Bengali people in one place.” Tofazzal Liton, the chief planner and the brain of this years Boishaki mela said, “We have never imagined...not even for a second that these many people will attend Boishaki mela. I want to sincerely apologize to the ones who couldn’t attend this year’s event. It was great to see so people at the mela. But next year we will keep this in our mind and reserve a much bigger place than this year’s venue.” The mela included local artists and performers, children, young people, and cultural groups. Also, many vendors with clothing, jewelry, and gift items and food were ready to server spectators. Famous Bangladeshi Singer Ferdous Ara did sing for the spectators. There was no entrance fee this years event. It was free for all. Actress Shirin Bakul, Ambassador Masud bin Momen, and Consul General Sadia Faizunnesa also attended in the mela.